Proper care and maintenance of your vinyl convertible top is not something that will always be top of mind, but is very important in order to keep it looking new and lasting longer, which will save you time, effort and money down the road. If not cared for properly and regularly, convertible tops can become faded, cracked and eventually damaged to a point beyond repair, leaving you only one option — replacement. Luckily, with regular cleaning and maintenance, you can enjoy your convertible top for years to come. Cleaning your vinyl convertible top regularly, and with the right convertible top cleaners, is the key to keeping harmful contaminants such as dust, dirt, sand, salt, bugs, tree sap, bird droppings, etc from accumulating on your top. It is best to use a product specifically designed for convertible tops. 303® Automotive Tonneau Cover and Convertible Top Cleaner is designed to work with all convertible tops and tonneau covers, from vinyl to fabric. It will safely clean without damaging any outer vinyl coatings, and rinses residue free. First, rinse the convertible top thoroughly to remove any loose dirt, solids or debris. While the area is still wet, apply 303® Automotive Tonneau Cover & Convertible Top Cleaner generously, but no need to oversaturate. Agitate treated surface lightly with a dampened soft nylon brush, terry cloth rag or sponge. For difficult stains, let cleaner stand for 10-20 minutes, before scrubbing lightly to loosen the stain. Rinse thoroughly with clean water (always rinse before surface dries). Warmer temperatures, agitation, and longer dwell times aid the cleaning action. In cold temperatures, allow cleaner to work longer before rinsing. 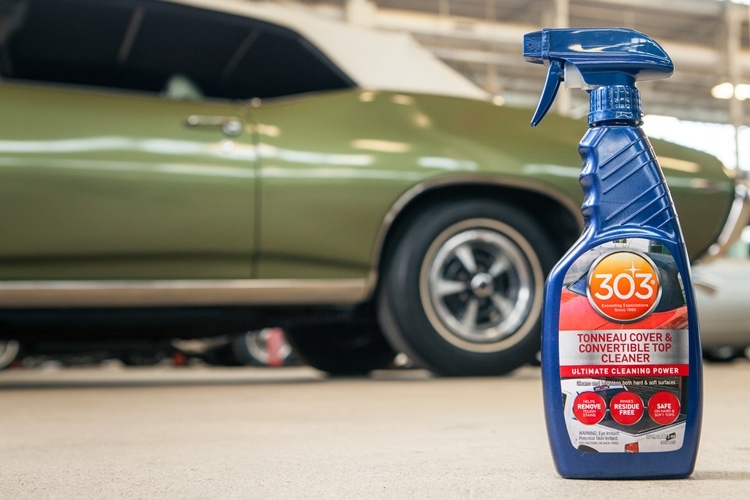 Once your vinyl convertible top has been properly cleaned and dried, it should be treated with a vinyl protectant product, such as 303®Automotive Protectant. 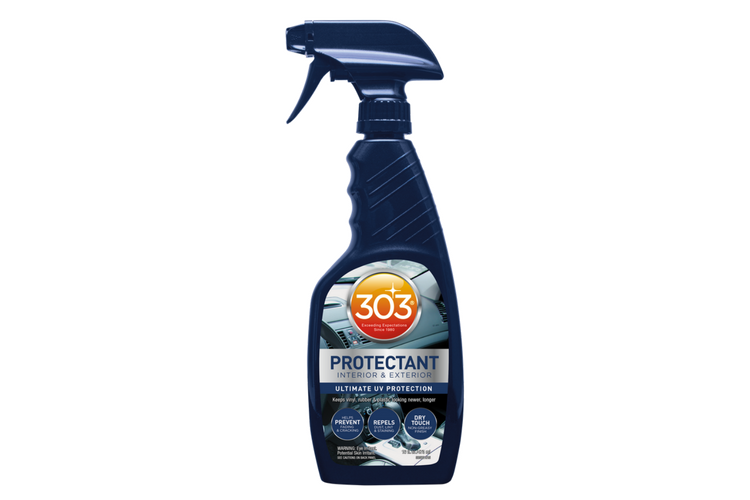 303® Automotive Protectant prevents UV damage from the sun’s harmful rays, as well as repels dust, dirt and debris. This product also helps bring out your top’s natural color and luster. Simply spray 303® Automotive Protectant on your vinyl top, and spread evenly over the entire surface. Once it has been evenly spread, buff out any excess product with a clean, dry microfiber towel. This process will leave a dry, matte finish that will not attract dust and will protect your top from UV rays for 30-45 days. Note: this product also works on your vinyl, plastic, and rubber interior pieces to protect them from the damaging sun. Keeping your vinyl convertible top clean and protected at least once every month or so, will ensure it stays in tip top shape, and allow you to enjoy your convertible top up or top down, for years to come!